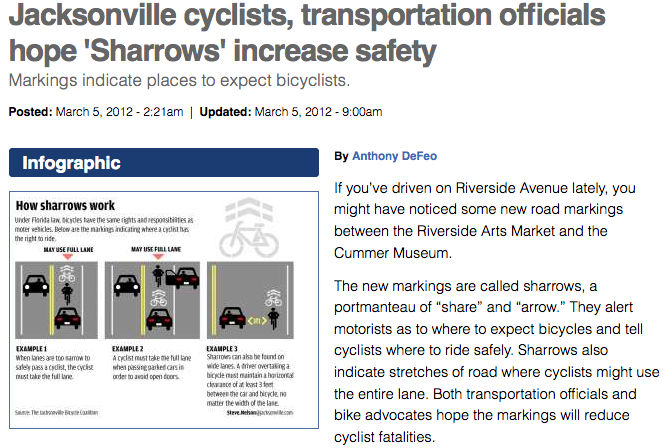 An uncommonly neutral and critically informative article regarding sharrows. What a concept! After so many frustrations with the media bias against cyclists, there is at least one journalist who remains neutral, to the point, and critically informative about the new road markings on Riverside Avenue; markings that help keep our citizens safe and do not actually slow down traffic in any significant way; markings which serve as the beginning of more infrastructure to protect both cyclists and pedestrians from the third most dangerous city in the nation. All I can say is – THANK YOU! If you’ve driven on Riverside Avenue lately, you might have noticed some new road markings between the Riverside Arts Market and the Cummer Museum. The new markings are called sharrows, a portmanteau of “share” and “arrow.” They alert motorists as to where to expect bicycles and tell cyclists where to ride safely. Sharrows also indicate stretches of road where cyclists might use the entire lane. Both transportation officials and bike advocates hope the markings will reduce cyclist fatalities. Under Florida law, while operating on the road, bicycles have the same rights and responsibilities as motor vehicles. When cycling on a road at less than the normal traffic speed, cyclists are required to ride either in a bike lane, or if one doesn’t exist, as close to the curb as possible. In some areas, such as on a stretch of Riverside Avenue, the road is too narrow to let cars pass cyclists safely. Florida law requires drivers to maintain a distance of at least 3 feet from cyclists at all times. On narrow roads, this makes passing and riding side-by-side with cars impossible. In cases like these, bicyclists are legally allowed to occupy the full lane. “That’s kind of a notorious area where motorists try to get around cyclists and it’s really narrow,” said Jennifer Kubicki, director of the Jacksonville Bicycle Coalition. Sharrows are also used to help cyclists avoid getting hit with doors where on-street parking lanes exist. The markings are painted 4 or 5 feet from the parking lane and serve the dual purpose of showing cyclists where to ride safely as well as alerting motorists to their presence. The markings aren’t introducing any new rules of the road, according to Christopher LeDew, assistant district traffic operations manager with the Florida Department of Transportation in Jacksonville. Instead, they’re simply reinforcing existing law concerning cyclists and motorists, and they’re being painted in limited situations to help raise driver awareness. Along with introducing sharrows in select areas, LeDew said the department wants to work to connect many of the city’s disjointed bicycle lanes and other bicycle facilities. He said that the new markings won’t slow down traffic flow much where they’re installed. The markings are placed only for short sections, and typically, on low-speed (below 35 mph), narrow roads. The department is reaching out to motorists by printing informational fliers and postcards and hopes to educate motorists about the right way to share the road. ← Bike Jax’s First Annual Tweed Ride is this Sunday! When you have a bike lane that is adjacent to triffac, you run the greater risk of sideswiping and drifting-related injuries, unlike with the cycle tracks. Also, we all know where trash and debris from the road end up after a while – on the side of the road, or in this case in the bike lanes. So there’s a greater risk of cyclists needing to veer out of the bike lane. And the same mindset that makes motorists try to sneak by cyclists on a non-bike-lane-equipped road, that painted line that indicates where a lane is demarcated, gives a driver a false sense of how close he or she can get to a bike lane. . You say that “Standard bike lanes can also be ended in advance of an intersection with dotted lines to make it clear that drivers need to merge to the right before turning.” The bike lanes that we have in Columbus, few though they are, have this in place. And, were they to be used properly by either cyclists OR motorists, they’d help out with the collision factor at intersections. However, the use of the dotted lines is most certainly not clear, as you can observe by sitting and watching one of these intersections for a while. That’s an education issue. If you’ve ridden bike lanes like this for any amount of time, you know that most drivers don’t have any idea how to negotiate those. And on the occasions when I do have to drive, most cyclists don’t understand that you’re supposed to move over into the general triffac lane when going straight through an intersection. Again, this is an education issue. Stats like those in the Streetsblog article do show that increases in cycling may make for fewer collisions, that’s most certainly true. But there’s nothing there to indicate that bike lanes are the reason for the safety increases. Good point. It would be great to also write your comment on the actual page of the TU article so that the writer can see it.